For humans, being a bartender is pretty easy. You serve drinks to people who want drinks. But for a robot, working out who wants a drink and who's just hanging out at the bar isn't so easy. Researchers at Bielefeld University are trying to teach a robot bartender named James how to tell the difference between a thirsty patron and one who's not interested. To do so, they're asking humans to step into its shoes and look through its eyes. 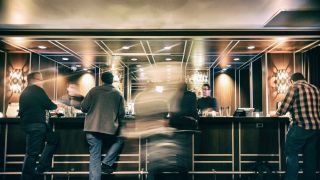 "We taught James how to recognise if a customer wishes to place an order," said Jan de Ruite, who runs the research group building the bartender-bot. "We asked ourselves how a human bartender solves the problem and whether a robotic bartender can use similar strategies." That could mean proximity to the bar, the angle they're turned towards the bar, whether they're speaking, and more. To prioritise all that information, the team performed an experiment in a mock bar. Information was collected by the robot and presented to a volunteer sat at a computer in another room, who then had to choose the robot's response. It continued until the customer left or a drink was served. Turns out that not all signals are equal. "Customers wish to place an order if they stand near the bar and look at the bartender. It is irrelevant if they speak,' says Sebastian Loth, co-author of the study. Once it's clear that the person wants to place an order, however, body language becomes unimportant. "At this point, the participants focussed on what the customer said,"
Loth added: "This is applicable to all service robots and many other applications."